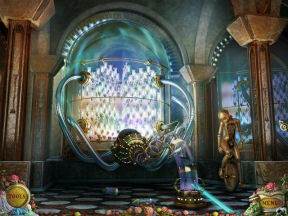 This is the second in a series of editorials about storytelling in Interactive Hidden Object Games (IHOGs). In a previous editorial I discussed character-driven IHOGs, which tend to be linear, with well defined characters, twisty plots, and challenges that often spring from the protagonist's talents or abilities. The gamer slips into the protagonist's role, not by solving puzzles related to the protagonist's character or occupation, but by being caught up in the urgency of a quest. Most of the puzzles spring from the forbidding, often fantastical environments that the hero sets out to explore, understand, or conquer. Some examples: the hero might be challenged to rescue people, restore natural environments, repair mechanisms, explore under water, enable portals to alternate realities, travel in time, bypass guards or security systems, and use magical or chemical concoctions. The hero quest or hero's journey is a common narrative theme in books, films, and games, sending the protagonist to an unfamiliar, foreign place or to a familiar place that has been radically transformed by time or disaster. In order to "find himself," the hero must first lose himself and then struggle to discover a way back. The quest is a test of character; courage and self-sacrifice are common themes. The quest can also be a journey into hidden or unpleasant truths, where knowledge acquired or actions taken are essential for setting things right upon the hero's return. The stakes are always high, with the fate of a family, a village or even a civilization resting on the hero's shoulders. Non-player characters (NPCs) encountered on quests may be victims or allies of the villain or even heroes who have previously failed the quest. The NPCs sometimes have knowledge that the hero needs, or they guard artifacts and ancient/sacred places. Often they are not fully developed as characters, but are there as gatekeepers or task-givers. The villain in IHOG hero quests usually doesn't get a lot of screen time. He may be a shadowy character with one particular ambition -- eternal youth, absolute power, or revenge. His influence is felt in the environment or through the actions of other characters. The hero must learn enough about the villain to locate and/or identify him and then (since a handy policeman is never around to make an arrest) figure out how to defeat him. Sometimes the environment itself becomes a "villain" in the form of storms or natural disasters. Below are six examples of IHOGs with a hero quest (or heroine quest, since many of the protagonists are female). These could be broadly classified as games with fantasy, historical fantasy, disaster, science fiction, and horror themes. I've also included a game that would probably best be described as a dark fairy tale. *Note: I'm aware that many gamers partner with their young children to play IHOGs. I've put an asterisk in front of each game that is more appropriate for teens and up, rather than young children. There were two close calls. Shaolin Mystery: Tale of the Jade Dragon Staff is appropriate for children until the end of the story, when there's one brief but indelibly violent image. Time Dreamer has a couple of vulgarities in it, but otherwise is appropriate for children, except that the atmosphere is dark and the plot moves between different time periods, so that a child might have trouble following it. 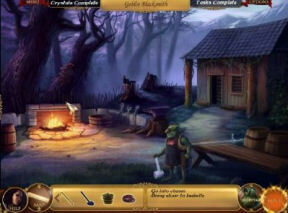 Set in a fantasy world not unlike that of the King's Quest games, A Gypsy's Tale contains the most nonlinear story of all the games discussed here. You assume the role of Reylin, a wandering gypsy hired to break the curse on a tower. You learn that there's more to breaking curses than originally envisioned and that much goes on beneath the surface. The graphics are painterly and nostalgic. The atmosphere is quaint, with forest scenes and dwellings that would accommodate a hobbit, should one drop by. The environments are meant to charm and entice; until the game's end they are lovely and welcoming, though evil's influence is also apparent. The game starts out slowly, but picks up as you begin to meet the characters, including a gnome, a water horse and a real estate agent (the interactions are brief and the characters are not voiced). 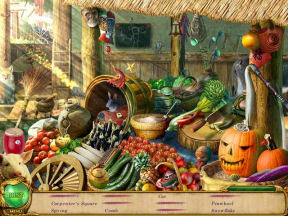 The Hidden Object (HO) challenges include finding items in various categories and searching for items or parts of items shown as images surrounding a wheel. In the latter instance, once found, the items automatically combine to form the finished object. 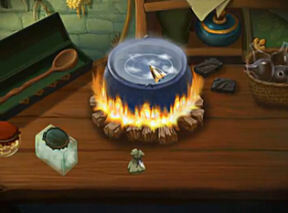 Puzzles include inventory challenges, pattern puzzles, and creating potions and other concoctions. Many tasks involve solving something that's gone wrong in the environment -- bringing a garden back to life, fixing a fountain, making it rain, healing a deer. You'll nearly always be doing several tasks at once. You can wander through the gameworld, but there's also a map with hotlinks. This nonlinearity works with the story, partly because the map makes it easy to visit every location to see if anything has changed or if the characters have something new to say. (One downside to the game's nonlinearity is the role of invisible triggers; if you miss a trigger you might have to resort to the hint system in order to progress.) The game toys with your expectations as to how a story in a fantasy world ought to unfold, and it provides a satisfying ending. This is a journey through ancient China and through fantasy environments that house fragments of the fabled jade dragon staff. Our heroine -- a young woman named Yu -- watches as a childhood friend, Zihao, is arrested by the Imperial guards. She manages to talk to him in prison, and he reveals that he is the true emperor, trying to escape his power-usurping uncle. Zihao's execution looms unless Yu can reassemble the fabled jade dragon staff, which will allow Zihao to take his rightful place on the throne. Yu is loyal, resourceful and determined, though not much else of her personality is revealed. The villain is a distant figure -- his rule is characterized by encounters with the oppressed city dwellers, rebels, and prison guards. The story unfolds in chapters, with cut scenes showing still images, and with a narration voiced by the heroine between chapters (character dialogs aren't voiced). By game's end, Yu has witnessed strange and wonderful sights in the realms of myth, and is beginning to understand the depth of magic and myth. The graphics appear hand drawn and include city locations as well as magical environments with monumental structures, spectacular flora and odd fauna. Varied animations add a sense of ambient movement. The locations -- especially later in the game -- evoke a sense of mystery and awe; they are meant to fascinate and intimidate. Each location has creatures to converse with, though dialogs are so brief that character interaction is overwhelmed by the mystery and color of the landscapes. Puzzles include inventory challenges, pattern analysis, assembly challenges and mini-games with Asian themes. You will be manipulating the environment -- replacing missing crystals, adjusting weights, snaring insects, awakening dormant spirits. Each location has HO "find" lists with unusual objects to admire. Each location also contains images arranged in a circle that depict items that must be found. The image wheel challenges seemed to fit the environments and the story better than the "find" lists. A diary, or some way to provide a bit of background information about the fantastical places Yu explores, would have satisfied this gamer's desire to know even more. The good ship "Neptune" has wandered into the path of a hurricane, and during a brief lull, rescue helicopters attempt to evacuate everyone on board. One passenger, Sarah Brooks, chooses to remain on the sinking ship because she knows that her children and husband are trapped somewhere below. Can she find them and get them out before the ship goes under? 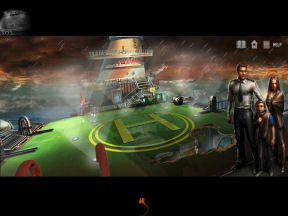 This game uses a current day setting and naturalistic graphics, but the normally safe environment of a cruise ship has become a horrifying mockery of itself, as the ship founders, breaks in half, and part of it turns upside-down. You are dealing with rising water, failing electrical systems, locked doors, massive chunks of debris, and even an opportunistic shark. I didn't expect the drama of a disaster story to work well with HO "find" lists, but Nightmare on the Pacific combines the two surprisingly well. It makes sense, under the circumstances, that items have fallen, skidded across the deck, and ended up in a heap. It's fascinating to see what has happened to the inside of the ship as the storm slowly rips it apart. In the pub area, for instance, you could have a drink at the underside of the bar, should you choose. (Bottom's up!) The groaning of the ship's timbers and various watery noises are accompanied by ominous music that merges with the sound layer. The main character's voiceovers are believable and add to the atmosphere of urgency and strain. 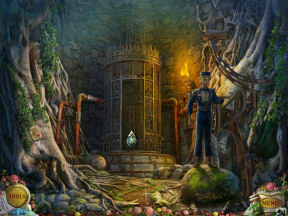 In addition to the "find" lists, the game contains inventory puzzles, and challenges in which you unlock or force doors to open, restore valves, put out a fire and remove a chandelier. The Premiere Edition includes a prequel which adds a brief backstory and lets you see a small portion of the ship before the storm strikes. This game has a creepy atmosphere and a surprisingly sophisticated story, especially for a game that otherwise fits the definition of a hero quest. You awaken from a coma to discover that your father (a research scientist) is now dead and your hometown is being taken over by your father's employer -- a corporation called INFAM (it isn't clear at first if this is supposed to have the sense of "in the family" or "infamous"). You are visited by a friend of your father's named Giovanni, who has steely eyes and an odd little moustache. Giovanni explains that you have an unusual talent -- you can travel through time while you sleep, theoretically granting you the chance to change reality. Giovanni wants to help you mold the environments in the past so that your father will still be alive in the present. 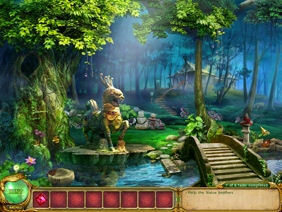 In Time Dreamer, you not only travel into the past, but also into the future. Graphics in the game are sometimes naturalistic, and at other times surreal, and the locations are more restrictive than in the other hero quest games I've described. You visit your home at various stages in time, plus the INFAM offices -- going from the corporation's modest beginnings to its futuristic culmination. Quirky music adds greatly to the atmosphere. During your travels, you will interact briefly with other characters; dialogs are unvoiced. You will uncover family secrets and evidence of dirty dealing. As your understanding increases (despite slip-ups), you begin to make better time-related decisions. 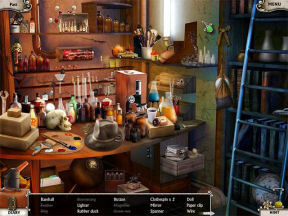 The game features inventory puzzles, sabotage challenges and HO "find" lists, some with a wacky sense of humor. Certain items foreshadow events in the game and perhaps give an alternate explanation for what's going on. On the "casual" setting, you can choose to see items in silhouette in addition to the word descriptions. The plot in Time Dreamer advances in nonlinear chunks; at points I felt as though I was hanging onto the correct sequence of events by mere fingertips. Reading the diary helps greatly to keep track of time periods, what's going on in each, and the results of the changes made in time. Strong-willed, and well-intentioned, Christine has left her home and travelled to an isolated island after receiving a letter from her grandfather. Cut off from civilization, she finds an (almost) abandoned asylum. Christine's task is to find out what has happened in the past at this ominous place, and, with the help of others, decide what to do about it. 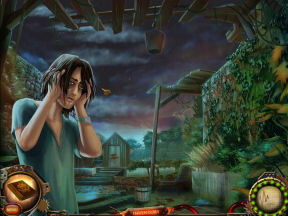 The game gradually gives up its secrets as Christine puzzles her way through the asylum and deep into the island. Cassette tapes left by previous inhabitants give a patchwork auditory record of events, and tease as much as they explain. 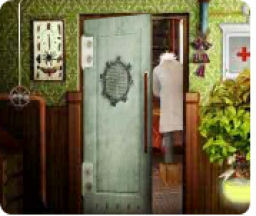 Challenges include inventory puzzles, placing items in the correct order, and solving complicated locks. The asylum is built to impede anyone attempting access -- many of the tasks involve bypassing the security measures. Much of the place is tumbling down, so that fixing machinery to gain access is also important, as is creative use of certain medical equipment. The game contains traditional, close-up "find" lists. Sometimes the HO screens are eerily beautiful. Other times they are distinctly unsettling -- especially the ones with a bizarre sense of humor. Asylum Conspiracy has an antique, hand painted look, sometimes glowing with iridescent light. Odd angles throw the viewer off guard. The various locations speak of terror, pain, luxury and cruelty. (The notebook contains a map, but it is not hot linked.) You wouldn't expect an asylum to draw the you in, but somehow this one does. Dialogs with a handful of characters are brief. Voiceovers are excellent. You learn snippets of the characters' histories -- enough to make them sympathetic, though not enough to feel deeply involved. They seem alarmingly willing to let Christine continue on alone to confront an ultimate evil. By the end of the game, you have an inkling as to what is behind the horror, and will probably be wildly curious as to how the villain has managed to propagate this scheme for so long. Souls of the Innocent is an odd combination -- a game with dark, sinister themes, yet bright, hand drawn graphics. The castle is equipped with bizarre contraptions, many different types of locks and keys, and signs of genius devolving into madness. An ancient evil, long dormant, has been awaiting the right catalyst in order to be revived. As the quest progresses, you encounter different variations of the human form -- the puppets, dolls, figures in paintings, skeletons -- most in a stage of disassembly, decay, or entrapment. 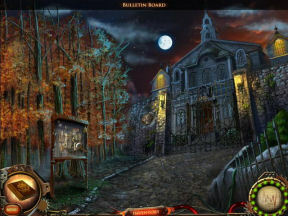 Animations in the game are varied and add considerably to the queasiness of the atmosphere, as does the unusual background music with punctuated vocals. Despite the delicate use of color, the environments are meant to disturb and frighten. The whole effect is wrenching enough that at one point I abandoned the game and then returned because I had to know how it was all going to turn out. Puzzles test your abilities at pattern analysis, inventory application, and (occasionally) your willingness to experiment. Repairing, using, or stopping the puppets is part of the challenge, as is fixing machinery and getting past unusual locks and other types of barriers. Traditional "find" lists make up the HO challenges. The castle you are exploring contains three towers, each harder to reach than the last -- and by the time you finally mount the steps into the third tower, you are wildly curious as to what is finally going to be revealed. To recap: in hero quest Interactive Hidden Object Games, you are interacting with challenging, expansive, strange and exotic environments -- much more than with other characters. You have some degree of control over where you go and the order in which you accomplish some of the tasks. Nonlinearity often means that the story is fairly simple and the pace may be uneven. If the story is complex, nonlinearity means that keeping track of events can be a challenge in itself. Some thoughts after playing the hero quest IHOGS described above. A few of these games would have been more satisfying if they had provided more backstory. I personally enjoy learning more about the gameworld in diaries and journals -- but I know that extensive text passages aren't necessarily every casual gamer's favorite thing. Two of the games provide backstory in different, intriguing ways. Nightfall Mysteries: Asylum Conspiracy contains cassette tapes scattered throughout the locations that can be played to give a sense of how the Asylum employees were faring before Christine arrived. 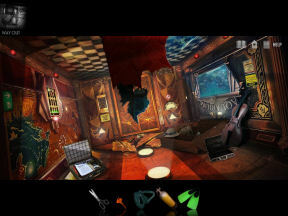 Nightmare on the Pacific (Premiere Edition) provides a playable prequel level after the main game is complete. Hero quest games can be full of dramatic tension (Nightmare on the Pacific) or they can be more contemplative (Shaolin Mystery: Tale of the Jade Dragon Staff). The nonlinear exploration in these games lets the gamer examine everything much more closely than she could if this same story was being told in (for instance) the form of a film. Taking your time and drinking it all in does tend to reduce dramatic tension -- since the gamer controls the pace, the pace can become quite slow. As a slow gamer myself, I just want to confirm that games that give the option to take things slowly are just as enjoyable (in fact, more so) than games that speed things up by using timed challenges. Slow gamers appreciate having a "relaxed" vs. "timed" option, and, as a result, probably come through the experience with an increased appreciation for all the details in the gameworld. An intriguing aspect of IHOG hero quests is the issue of the protagonist's gender. Most IHOGs have female protagonists (this is common in casual games, since the majority of casual gamers are female). Two of the games noted above involve storylines in which an able bodied male character with knowledge of the environment chooses to stay behind while the female protagonist goes on to (what is for her) an unfamiliar place filled with evils and/or physical dangers. For the heroine to take on dangers that no one else can face suits the theme of a hero quest, but this sometimes involves downright odd decisions on the part of male NPCs. If capable, strong men choose to stay behind, they need a good reason. Taking care of a child -- the excuse in the games I've played -- isn't a sufficient reason. Finally, the issue of "find" lists. In games like hero quests that are focused on environment-based challenges, close-up "find" lists -- especially those with items that have nothing to do with the story or the environment -- tend to disrupt this gamer's sense of immersion. Partly it's because I have to suddenly start thinking verbally (keeping random words in memory, most of which have nothing to do with the quest). Partly it's because the close-up areas are often different in appearance (and sometimes different in theme) than the rest of the gameworld. In my experience with hero quest games, HO challenges that use image wheels or fragments of objects are better at retaining that sense of immersion in the environments, unless great care is taken to make the "find" lists suit the environment and overall theme. Look to this space to see more discussion of stories in casual games. But first, a slight detour into a different theme, the next installment in this series: "Casual Adventures -- Testing the Atmosphere." **Hero quests in IHOGs bear some resemblance to Joseph Campbell's conception of the monomyth. You can read more about it at Wikipedia.